So far, September has been an exciting month, what with losing the AC and staying at a hotel. Ken fixed the unit this morning, replacing the capacitor and the contact switch thingy (and purchased the compressor fan motor to replace when we get home this weekend), all for $75 in parts. Thanks to his son who was able to order the parts at cost for us. We hustled to get packed and I spent a good 30 minutes soaking the beds and tomato strip extra deep. 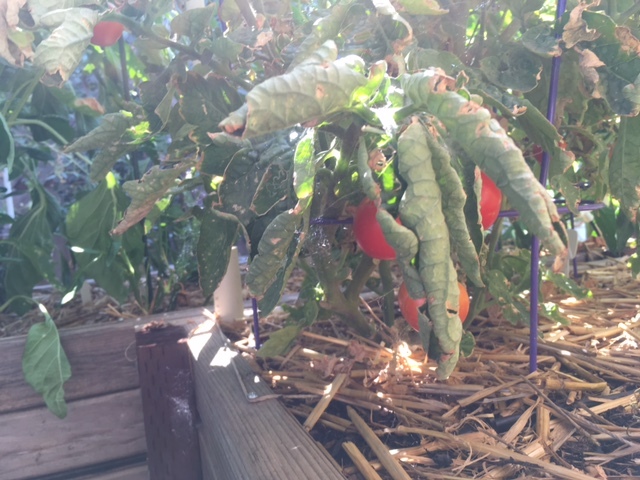 Harvested some tomatoes and eggplants that wouldn't survive until our return. Got to Petaluma (north of SF) by dinner time. Tomorrow is our full day in Santa Rosa at the Heirloom Exposition. 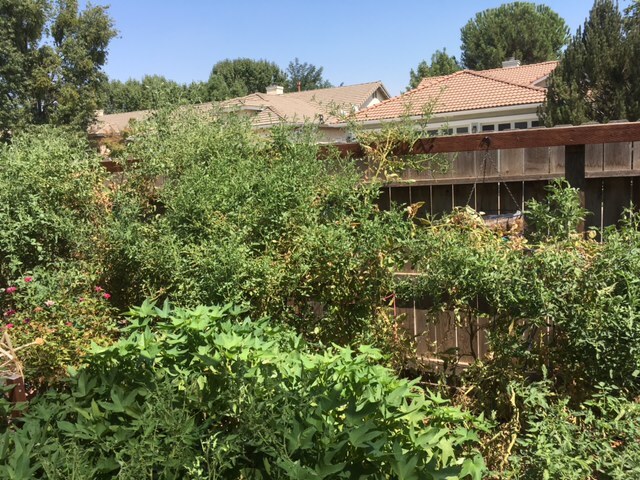 This general area is the fine wine area of California and also a perfect vegetable growing area with warm summers, clean air (except for wild fires) and mild winters. Have a great time at the show, S! Here it's all work and no play. I moved a wheelbarrow full of of rocks to raise the "host bed" (milkweed, Dutchman's Pipe) in the Salad Bar. I want to fill it with leaves for the winter to improve the soil for next spring. 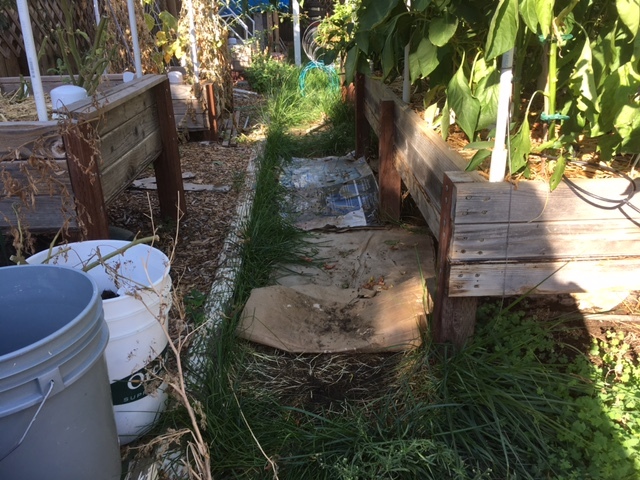 After that I turned a pile of compost to get to the good stuff on the bottom, and used that to re-dress the bean/pea beds in the Rescue Garden. Then I planted snow peas in there. 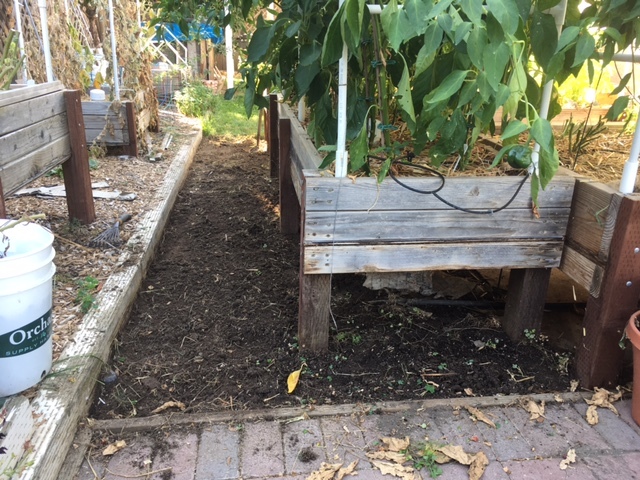 Next, it was back to the Salad Bar, where I filled in all the holes with a new planting of asparagus beans (direct sow). Finally, it was up on the deck where I started seeds for broccoli, Brussels sprouts, cabbage, cauliflower, celery, Pak Choy, & kale. 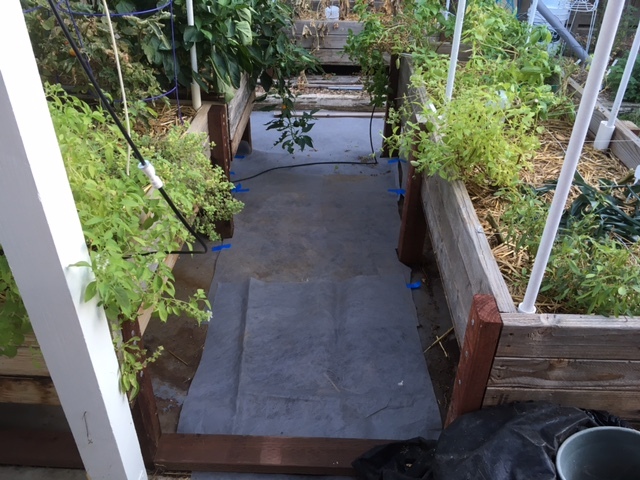 I still need to move more rocks, rake more leaves, and plant my root crops. CN, I got tired just reading about all you are doing. 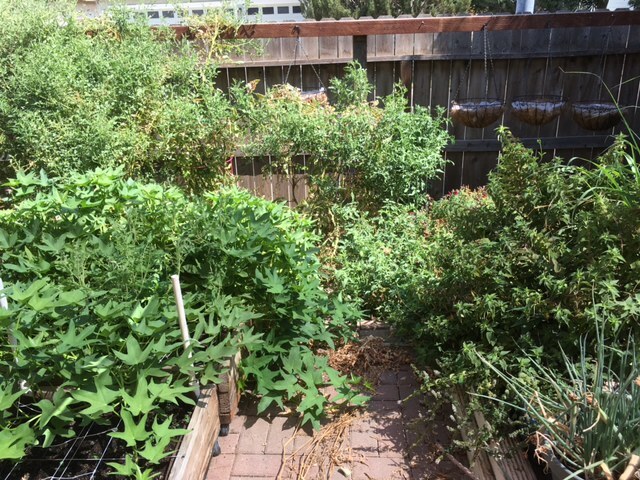 It looks like the sweet potatoes are taking over the patio area. Here are the 2 totes earlier this season. This was yesterday, Sunday morning. Some where under all those leaves are 2 totes and a 2x4' bed. When Mel mentioned 3' isles between beds, it was a good idea. 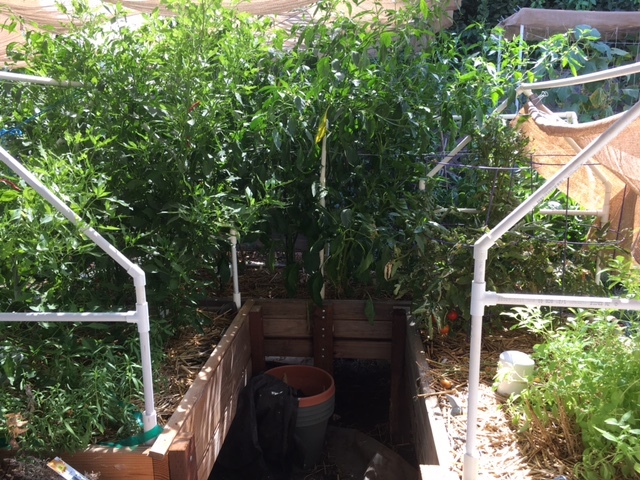 This is a tunnel of peppers and tomatoes I have to crawl through to get to the sweet potatoes. The keyhole 3 table tops. Can't go this way anymore. 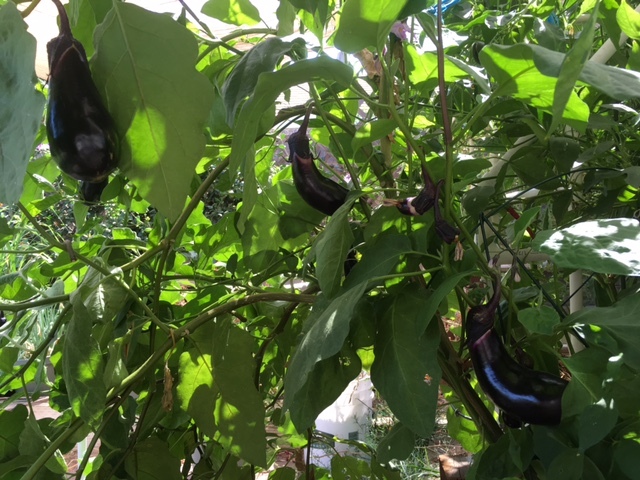 Eggplant and peppers and the beds I'm babysitting. 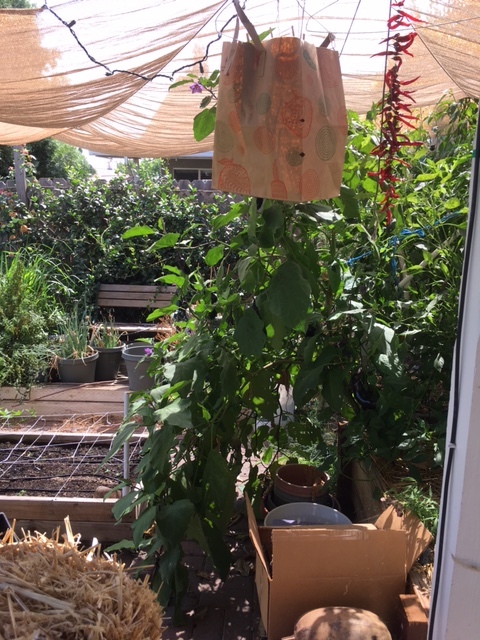 The paper beds have drying sorghum and the red things are drying cayenne peppers. 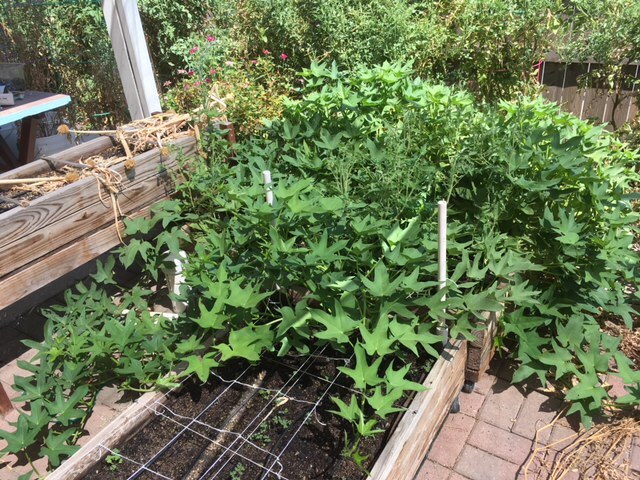 Hard to get through this way to tend the tomatoes by the sweet potatoes. 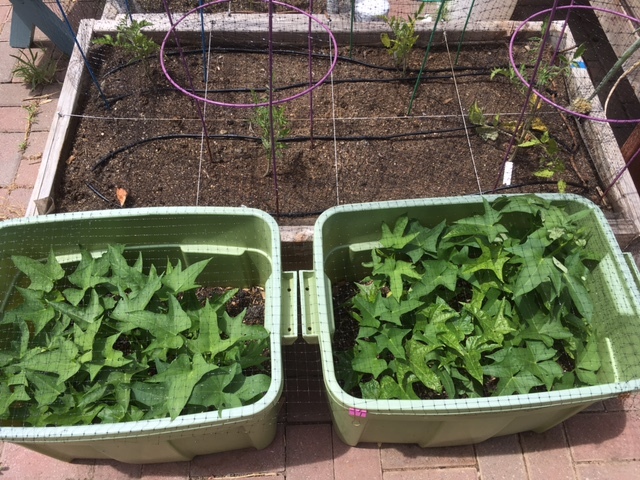 When I get rid of this stupid head cold, I have a lot of work waiting, including starting seedlings of winter crops. Sanderson, I love your amazing edible "jungle". Fantastic! Holey cow, Sanderson! Those plants sure do love all that their mommy does for them!!! Thank you, folks. 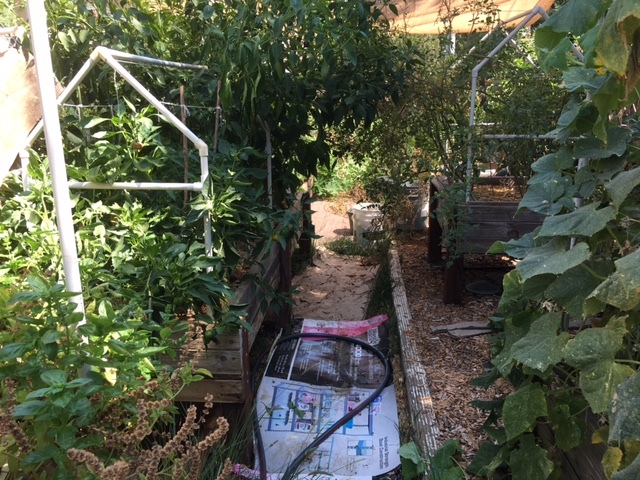 It's looks like a mess and some of you have such good looking gardens, I was hesitant to post these. Rethinking my fall/winter garden. I went to OSH yesterday (Orchard Supply -- a Sears company with a fabulous garden dept.) They had beautiful fall veggie plants, which I couldn't resist. They were pricey, but put my little seed starts to shame. Now I'm thinking I should have planted my seeds much earlier in the house . . . or . . . maybe it just doesn't matter and mine will catch up in a month and I could have saved my money. Time will tell. What say yee all? I agree that OSH is a great place to browse the garden department. Well, actually any department. Talk about being behind on the starts, that's me. Normally I would start the broccoli, bok choy, chard, etc. Sept 1, to plant out Oct 1. Well, I just finished planting the seeds in their pony packs this morning. Three weeks late. I've been sick for almost 2 weeks, now, starting the day after we returned from the Exposition and mini-vacation. I hope I can write more now that I am getting better. 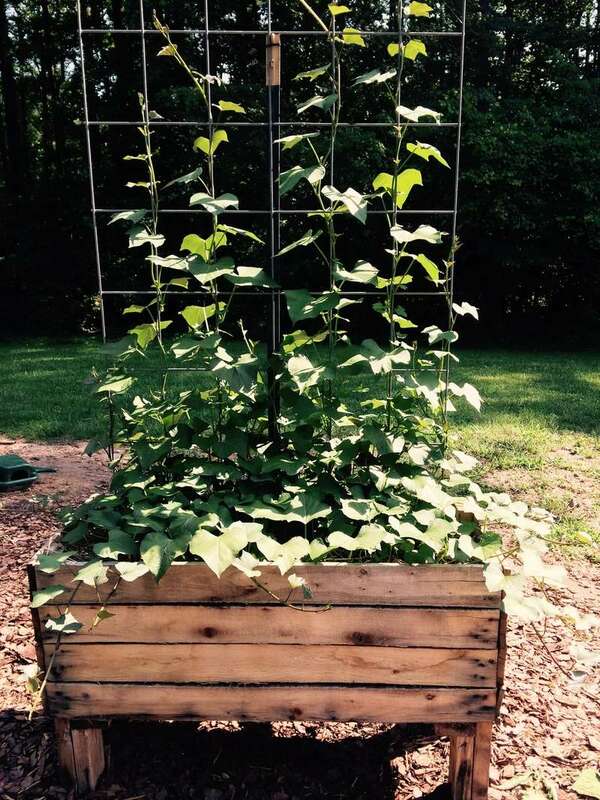 Sanderson - you can always try growing your sweet potato vines vertically. You do have a very nice looking jungle there in your backyard. I'm sorry you've been sick, but glad you're on the mend, now. Katie went back to OSH for me today, and bought some more plants. I've planted seeds for everything she bought, so this will be a real experiment to see where they all are in a month. I'm thinking plants may be smart in the spring, to get an early start, but may not be as smart in the fall, when harvesting is so far out. The problem is - - - I JUST CAN'T HELP IT! I'm weak! Ken helped me tidy up the main area of the beds. I can't wait to post photos of the improvements, probably Wednesday. @sanderson wrote: Ken helped me tidy up the main area of the beds. I can't wait to post photos of the improvements, probably Wednesday. He is en route to pick up the wood chips! @sanderson wrote: He is en route to pick up the wood chips! 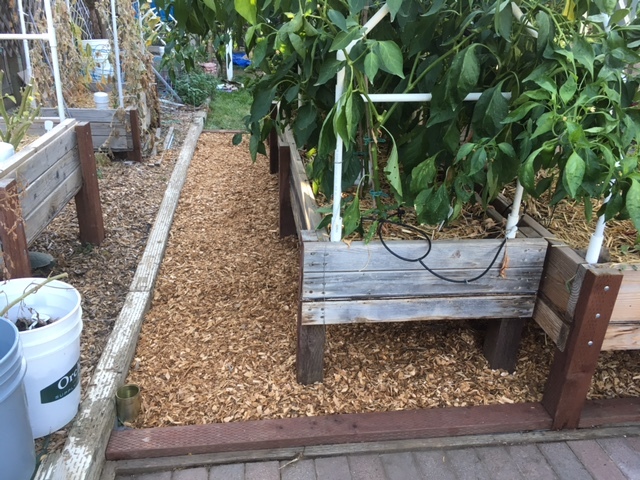 So, the wood chips are for the paths? Is this gonna go on all day? Looks like a cardboard-sheeting weed block to me (without the wood chip overlay). 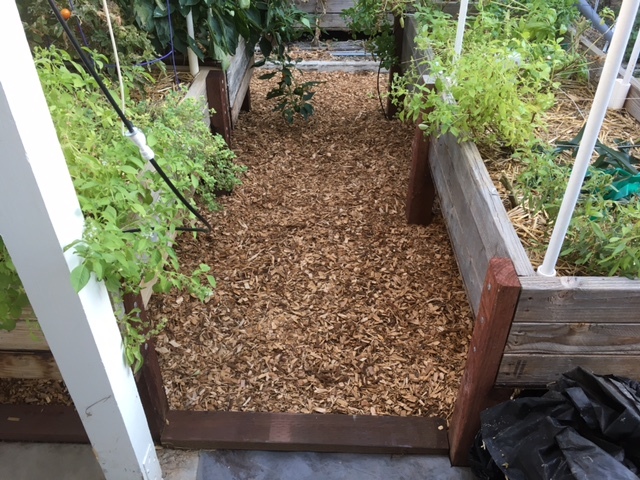 It's a good weed blocker, but it's slippery under foot if you haven't put enough mulch/chips on top. 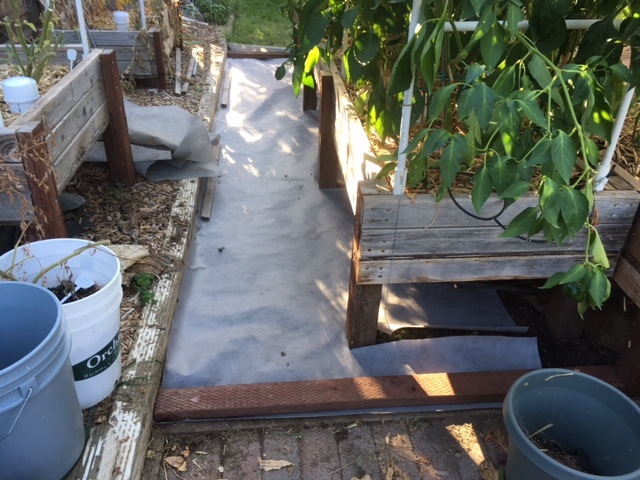 I've used old outdoor carpet pieces with sheets of newspaper beneath them to keep weeds out of beds that I have "sitting it out" this season. What's growing in that bed? Finally finished with the project. I strongly recommend that isles between the beds be heavily mulched. Plop a bed down on the lawn and in time the grass and weed seeds will find their way into the beds. Even for table tops like mine, over time the grass in the isles will be trod down to dirt which makes a muddy mess and allows weeds to grow. 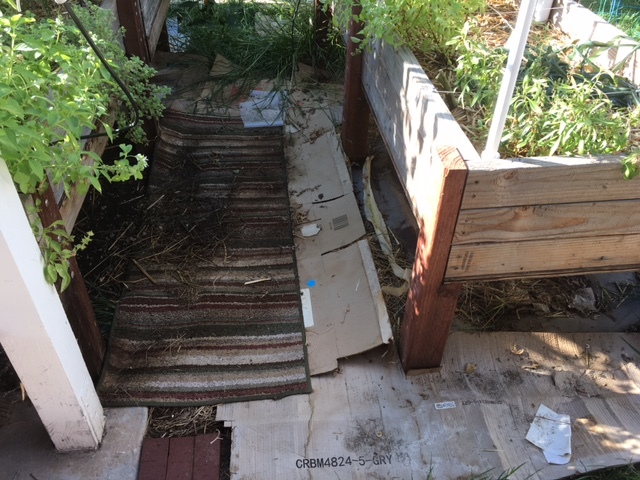 Being a garden hoarder I had a lot of cardboard (and an old rug runner) to spread on the isles to start killing the weeds and runaway grass. For those with eagle eyes, you may notice a food can with both ends removed. There are two pop-up lawn sprinklers that I surrounded with the cans. 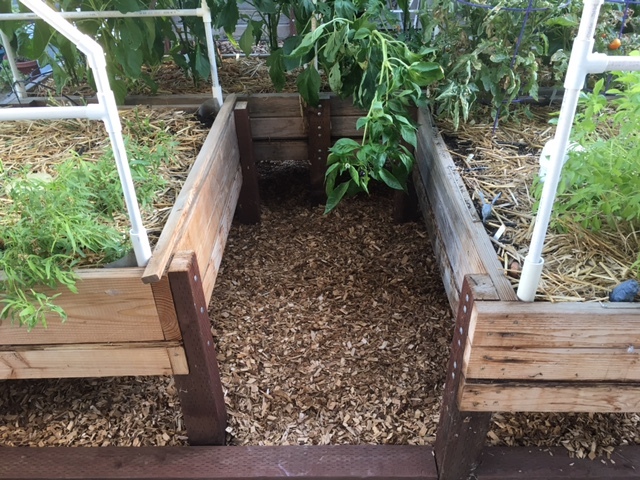 Even though the heads are turn off, they still pop up and I didn't want the wood chips to get into the unit and prevent them from popping back down when the water goes off. I will spray paint them later. View A - Before, weeded, commercial weed fabric and wood chips. View B: The keyhole area.